Michael Adams is a defense litigator for personal injury and property damage matters. He manages and handles all aspects of complex litigation for his clients including researching and drafting pleadings, motions and briefs and arguing matters before court. Michael also has experience in commercial litigation, insurance dispute and employment law. He has litigated a wide range of business litigation matters from breach of contract and warranty to conversion, fraud and wrongful repossession of collateral. Prior to joining Hinshaw in 2017, Michael practiced at a firm in Wheaton, Illinois for more than two years. 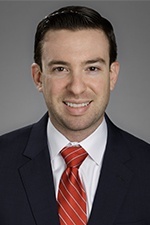 He was also a litigator at a Chicago-based firm, where he worked on a wide range of personal injury, premises liability and property damage matters, including claims for negligence, products liability, wrongful death and survivorship. During law school, Michael had clerkships with two Chicago-based firms. He was also a member of the Appellate Moot Court Society and a CALI Award Winner. As a participant in the Honorable William J. Bauer Moot Court Competition, Michael was awarded Best Overall Oralist.